If you ask me what is the item I could die for, without a second of hesitation I would refer to one of the footwear pieces by Sophia Webster or Charlotte Olympia. Both designers presented magnificent and absolutely mind-blowing Resort 2015 collections that are capable of turning any outfit that they complement into something incredibly outstanding. If you feel like adding vibrant hues into your summer closets, then you have to check out these striking shoes. Sophia Webster decided to make a unique combination the center point of her Resort 2015 collection. These gorgeous footwear pieces demonstrate a perfect vision of a summer lady – bold, bright and shining. I am in love with every single element of the collection and would by all means like to try all of them on. I can’t imagine how one would possibly not fall for these striking shoes, sandals and sneakers, as everything from design to color palette is beyond any discussion. You will equally like the knee-high lace-up gladiator sandals and the wedge ones featuring transparent material.The best thing about Sophia Webster collection is that any lady – regardless of her fashion taste and preferences – will find something that will speak to her. And that is quite an impressive fact for such a limited set of footwear pieces. Charlotte Olympia has released a breathtaking collection. Every single piece is full of awesome vibe and authentic touch. This time the designer was inspired by the engaging and hypnotizing scenes of Mexico – which is itself a very fair reason to fall in love with this set. If you also happen to be a fan of this fascinating country, then you have absolutely no right to pass by these adorable items. First of all, it is about the rich colors that are showcased here. None of your summer days is likely to be boring with at least one footwear piece by Charlotte Olympia. You will spot here every single shade – and sometimes in the most unexpected combinations. There is nothing impossible with these shoes, so if you consider yourself as a bold lady free of any sort of rules or stereotypes, then all of these items are definitely for you. The designer also presented a very engaging collection of handbags that will speak to you a lot. 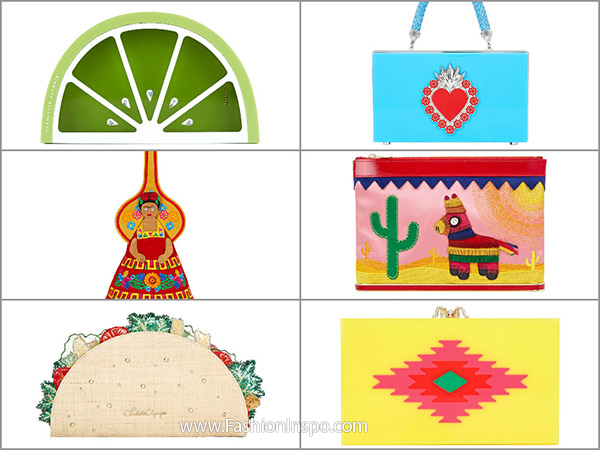 These items also reflect the Mexican theme and represent some of the most desirable bags ever. I would love to get any of them into my personal collection, as every single item is incredibly alluring and cool. The bright patterns and bold prints are entwined with the high-quality fabric and perfect performance. While some of these designs will be good for daywear, others can complement even an evening dress. Looking at this wonderful set I find it hard to not fall in love with Mexico itself – this is how realistic the scenes embroidered across the handbags look. What do you think about these mesmerizing designs? Which pair of shoes would you go for?